In 2011, I was named a Thomas J Watson Fellow, awarding me twelve months of international travel to engage in a topic of my own choosing. Through my project, Performing 'Model' Humans: What Puppets Can Teach Us About Empathy, I examined the relationship between puppets and people in a variety of performance cultures as a means for exploring ideas of imagination, projection, and empathy. I also kept a log of my discoveries, thoughts, travels, and adventures. You can read them all below. It is March 23rd as I am writing this. Today marks the start of the new Hindu year and people here in Bali observe the occasion with an island-wide day of silence. No cars or motorbikes are permitted to fill the usually busy streets, nor fire or artificial light for illuminating people’s homes. The airport in Denpasar has shut down for the day and work has been cancelled all across the island. For the stricter observers, there is no going outside and for the strictest, no food or water and no speaking aloud. To close the year, yesterday was the day of Ogoh Ogoh. In the weeks prior, villages all over Bali had been preparing at their Banjar by building massive statues from styrofoam and wire-mesh. As with the majority of stories told in Bali, many of the characters and scenes depicted came from either the Mahabharata or Ramayan, religious texts epic in scope and adventure. This was not a strict requirement of the Ogoh Ogoh festivities, though, and a few of the statues definitely exhibited imaginations run wild. I took these photos this past week while taking mini Ogoh Ogoh sightseeing adventure with friends. I tried to pick some of the best shots for the ten photos posted above and, not-coincidentally, most that made it up come from yesterday’s parade in the heart of Denpasar where the best of the best from nearby villages came to compete for the prize of Ogoh Ogoh of the year. I don’t believe that any Ogoh Ogoh statues were on display at the 1931 Paris World Exhibition where Antonin Artaud first saw the Balinese performances that would later lead him to write about Balinese arts and theatricality in such laudatory tones. Still, as I looked at all of these giant, fantastical creations, I was reminded of his writings on the Grotesque and that powerfully visceral visual poetry— separate from a play’s text— that he felt was so missing from then contemporary western theatre. The size of these Ogoh Ogoh dwarfed their on-looking public. Because of their light-weight and gravity-defying poses, many would shake in the wind, bobbing back and forth just enough make me think— if only for a moment— that they moved all on their own. Animation or no, the streets of Denpasar felt particularly alive all day, with Gods, Demons, and hordes of people coming out to celebrate the end of year and the Ogoh Ogoh. This all culminated in the day’s main event, a evening competition that saw every village’s Ogoh Ogoh parade through their local area of Denpasar, attached to a slatted bamboo base and carried by around twenty men. Just about the entire village comes out in support their Banjar’s statue, moving en mass alongside their Ogoh Ogoh and accompanied by their own mobile Gamelon. It was quite the event. I wish I could show you photos from the earliest productions, but the Gods of the Internet seem to have banished what few exist far beyond the realm of free domain. Were you to perform a google search for images related to R.U.R. today, the majority of black-and-white photos that you will find come from a production dating almost twenty years after its premiere, the 1938 BBC Television version. The Robots in these photos are in fact men dressed in costumes that could easily serve as forefathers to the Tin Man from the The Wizard of Oz; with boxy shoulders, geometric head pieces, and metallic fabric abound, the production’s machine-man aesthetic easily fits into the typical image of early modern Western robotic representations. Indeed, when England produced one of its first nationally trumpeted robots in the late 1920’s— a figure surprisingly similar in appearance but, this time, actually machine— they slapped the letters RUR on it’s chest. HELENA: [stands and offers SULLA her hand] How do you do? You must be dreadfully sad out here so far away from the rest of the world, no? SULLA: That I cannot say, Miss Glory. Please have a seat. HELENA: [sits down] Where are you from, Miss? SULLA: From here, from the factory. HELENA: Oh, you were born here? SULLA: I was made here, yes. DOMIN: [laughing] Sulla is not human, Miss Glory. Sulla is a Robot. DOMIN: [placing his hand on SULLA’s shoulder] Sulla’s not offended. Take a look at the complexion we make, Miss Glory. Touch her face. DOMIN: You’d never guess she was made from a different substance than we are. She even has the characteristic soft hair of a blonde, if you please. only the eyes are a bit… But on the other hand, what hair! "Young Rossum said to himself: A human being. That’s something that feels joy, plays the violin, wants to go for a walk, in general requires a lot of things that— that are, in effect, superfluos… [So] he chucked everything not directly related to work, and in doing so he pretty much discarded the human being and created the Robot. My dear Miss Glory, Robots are not people. They are mechanically more perfect than we are, they have an astounding intellectual capacity, but they have no soul." It was Josef, Karel’s brother, who first suggested the name ‘Roboti’ for Karel’s newly invented, soulless workforce. A play on the Czech word ‘Robota,’ which means “Serf Labor" or more figuratively, “hard work," ‘Roboti’ was fun to say and captured the essence of the idea without hitting you over the head with it (prior to ‘Roboti,’ Karel was considering ‘Labori’). Ultimately, Karel liked the idea enough that the name stuck— though sometime before the play’s premiere, “Roboti’ got shortened to just “Robot." Of course, all of this etymological history would not have mattered had the show flopped, but R.U.R. was a big hit, launching Karel Capek’s career into the international spotlight. New productions of the show soon spread to other countries, but with each new translation, the word “Robot" remained the same, too irresistibly catchy to localize. Quite quickly, the word ‘Robot’ began to mirror its namesakes in the plot from which it sprung, eagerly received as newly imported vocabulary around the word. ‘Robot’— that broad signifier of all artificial humanoid inventions designed to be loyal servants to their human masters— had become a world-wide linguistic phenomena. Except for in Japan… kind of. To be clear, R.U.R. was quickly translated into Japanese. It enjoyed its first localized run in 1924 at Tokyo’s famous Tsukiji Shogekijo, and it did manage to kick off a new debate among Japanese intellectuals about the role of robots in daily life. Along the way, however, it received a unique verbal facelift. In Japan, the title to Capek’s play— along with the word ‘robot’— was translated to Jinzo Ningen (人造人間), a Japanese phrase better translated back into English as “Man-made Man". Disconnected from its etymologically Slavic (and slave) roots, Jinzo Ningen emphasized the invented origins of these artificial humanoids over their intended purpose. To me, it’s a phrase that feels somehow less sinister— or at the very least, less value-laden— than its Czech original, a celebration of man’s inventive drive in lieu of a dark reminder of his desire to dominate all that surrounds him. And indeed, although the dramatic content of the play remained unchanged, Japanese audiences were described as responding to Capek’s play, and these new Jinzo Ningen, with far more curiosity and excitement than fear. Today, the term Jinzo Ningen has fallen from colloquial use in Japan, replaced by Robotto (ロボット), the Japanese phonetic approximation of Robot, which first entered into the Japanese dictionary in 1928. Although the ascension of Robotto may have placed Japan back instep with the rest of the world’s robotic lexicon, their unique detour feels significant to me, signaling something palpably real yet difficult to decipher, something that rests within those murky confines wherein fact and fiction collide in real-time. Is there a Japanese equivalent to Baudelaire’s “The Philosophy of Toys," I wonder, in which Baudelaire tells the story of smashing a child’s doll, fervently driven by the question “Where is the soul?". The most typical American descriptions of Japanese culture suggest that there isn’t— nor that there should be, thanks to Japan’s thoroughly non-Western religious traditions. Answers like this one, found in a Time Magazine article, invariably point to Japan’s Shintoist religion, “which," as the article writes, “blurs the line between the inanimate and animate, and in which followers believe that all things, including objects can possess living spirits." Factual validity of this answer notwithstanding, the certitude with which it is so frequently cited doesn’t sit well with me. It is, at the very least, lazy. More troublingly, to me it has faint whiffs of those unfortunate, still-lingering Orientalist airs that often hover around Occidental befuddlement over Asiatic culture. I don’t mean to suggest that a culture fostered in part through uniquely Japanese religious practices hasn’t impacted Japanese perspectives in ways significant and different from mine, but saying that Japanese people love Robots because their history of animism makes them believe that Robot have spirits would be like saying that Anglo-European people hate Robots because their history of Judeo-Christian monotheism makes them believe that Robots mock the powers of God, the sole Creator. There is a lot of good stuff to work with in there, but such a neatly rendered presentation belies a much more tangle, fragmented, and overlapping reality. And then of course, there is my perspective on this multi-cultural phenomenon, too— a perspective that is a no less complicated mess. Before beginning my Watson, I had never read anything by Karel Capek, nor did I know the etymological history of the word “Robot," or that R.U.R. was received so differently in Japan than in Europe and America. None of these facts, however, have since come as great surprises to me. That the first Western use of the word “Robot" should fit so snuggly within what Isaac Asimov has dubbed the West’s “Frankenstein Complex"— that is: Man builds Robot, Robot kills Man— made perfect sense to me; it is but one example plucked from the longstanding history of Anglo-European technological paranoia complexes, a historical narrative sometimes easier for me to accept because I was raised within it. That this same Robotic story should be met with far less terror in Japan somehow also felt right to me— though again here, it is difficult to chart where actualities end and self-fulfilling stereotypes begin. The 1950’s, for example, mark an important moment in the cementing of Japan as a world-wide ‘Robotopia.’ This was the decade within which Japanese robot toys first proliferated throughout the United States. But the United States deserves just as much credit as Japan for this stateside influx of little tin men. The aftermath of World War Two had left Japan in shambles. Formally occupied by the United States, early post-war Japan subsisted on hundreds of millions of American dollars delivered in the form of loans and emergency food supplies. But America wasn’t about to give so much without asking for something in return and— whether from an interest to help jumpstart the Japanese economy or out of pure quid pro quo— they soon summoned representatives from former Japanese cottage industries to the Occupation headquarters in Tokyo to discuss new exports. By the end of 1945, mere months since the war’s conclusion, the Japanese toy industry was already showing new signs of life, reassembling itself in preparation for its new client: American children. And these Americans— the boys in particular— wanted Robots. Following World War Two, fears of a robotic economic take-over fell alongside the American unemployment rate, but kids who grew up during the Robot threat were not about to forget their parents’ old enemy— and really, when you’re a kid, what is ever cooler than the stuff that makes your parents’ blood boil? And so, in the age-old ritual of inheriting your fore-father’s corrupting culture, the menacing imagery of these cold, steel beings grew even more widespread than before, transferring from one generation’s paranoiac prophesies to the next’s science fiction odysseys. 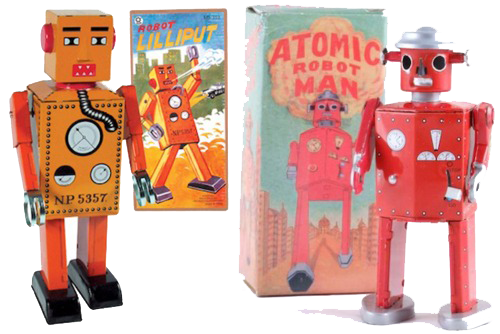 And it was at this point that Japanese toy makers entered the picture, repurposing their popular tin toy industry to make Robots just as the Americans wanted them: geometric, mechanic, and menacing. But Japan already had a few fictional robots of its own. In 1934, the same year that Jack Dempsey wanted to go robo-boxing, a Japanese artist named Masaki Sakamoto introduced Tanku Tankuro, a magical robot hero. In stark contrast to the predominately rectangular visions of Europe and America, Tanku Tankuro is all round surfaces, featuring a plump human head resting atop an improbably rotund, black spherical body. His head and short, chubby limbs protrude from five of the eight holes littering his body like swiss cheese. In a manner similar to Felix the Cat’s magic bag, these holes could produce almost anything at a moments notice, suddenly transforming Tanku into, say, an airplane with wings for arms and a large propellor jutting out from his front. Readers never learned the proper mechanics behind Tanku’s construction— nor how he produced or stored so many items inside his small body— but that was part of the fun behind the guy; although described as a robot, Tanku was more fantastical than mechanical, more parts imagination than cold science. In the comparison between Japan’s Tanku Tankuro and early Western robots, I see these countries’ contrasting relationships with pre-WWII technology, as well. It reminds me of a quotation from Osamu Tezuka, the so-called ‘Grandfather’ of Japanese Animation: “While the US. was dropping atomic bombs, the Japanese military were trying to light forest fires in America by sending incendiary balloons made of bamboo and paper over on the jet stream." Tezuka’s own Tetsuwan Atomu (Mighty Atom)— or as we know him in the West, Astro Boy— feels to me like an response to this observation, both by Tezuka and his readership. Although he was originally envisioned as a mere side character to serve as a humorous foil for human protagonists, there was something about Atom that strongly resonated with Tezuka’s audience. The boy robot quickly grew so popular that Tezuka’s editors asked him to serialize a new adventure just for Atom. In April of 1952, the same month in which the American occupation of Japan officially ended, the solo adventures of Tetsuwan Atomu debuted, eagerly devoured by fans all over the country. Atom quickly became a post-war hero for a post-war Japan, propelling Tezuka to national fame in the process. Atom’s design combines the more magical elements of earlier Japanese robots like Tanku with the greater concern for science and technology found in the west— concerns Japan is described as internalizing following their devastating defeat. Sure, Atom has rocket propelled jets hidden in his hands and feet that allow him to fly through the air; yes, he can increase his sense of hearing 1000-fold and turn his eyes into searchlights; and okay, he can even sense the innate good and bad qualities in the people around him. But Tezuka, a doctor by training, took great care to feature Atom’s intricately designed technological innards, as well— and in doing so, he caught up his hero with his contemporaries across the Pacific. And although the technological explanations given for the boy robot’s powers never really held up (despite repeated updates to account for new developments in actual technology), they were no less fanciful than the robotic creations that had waged war with American imaginations a decade earlier. Fictional though he may be, Atom was received as a true child of science. Tezuka took seriously the responsibilities and influence that came from his boy robot assuming this unofficial role of spokesperson for the scientific future. Atom fights for justice but, even more importantly, strives for world-peace. Deeply impacted by the devastation of Hiroshima and Nagasaki, Tezuka envisioned Atom and his not-so-distant-future as emblems of the possible harmony between man and machine, a time in which nuclear power was used only for good and creative forces. And so, when he’s not defending the world, Atom the Robot goes to school, keeping boyhood friends like all other humans. He is the “robot next door," not just a protector or servant, but also a friend to all humans. And yet, the world of Tetsuwan Atomu is not all utopic. One of the most consistent tropes in the Atom series (and to my mind, one of its most endearing qualities, as well) is Atom’s ongoing attempts to be more human— inevitably followed by the somewhat awkward, sometimes sad reminders that he will never be like his friends. His origins story tells the tale of a grief-stricken inventor who sought to fill the void left by the death of his 12-year-old son by rebuilding him in robotic form. As such, Atom does look and sound quite like his human model. But the gaps between he and his breathing counterparts are felt as all the more unbridgeable because of his almost fully human construction. Eventually, Atom’s inventor could not bear the differences between his lost son and his flawed creation, and abandons Atom on the streets. But even the kinder and more loving scientist/father-figure who later takes in Atom cannot really help the boy’s inhuman flaws, and the modifications he offers only reinforce Atom’s differences. For example, when Atom discovers that he cannot cry, his new scientist father is able to augment Atom’s design to allow for tears, but he still cannot teach the boy about real sadness. While Atom can solve complex math equations at unparalleled speeds, he struggles to understand art. And whenever he eats food, he must later open up his chest cavity and remove all he swallowed. He is, in a sense, too perfect; the only flaws in his construction are his lack of the flaws that figure so centrally into being human— flaws made all the more glaringly visible by how close he comes to us. Tezuka claimed that a translated copy of R.U.R. served as one of the earliest and greatest influences on his robot-driven narratives, and although the more technologically advanced future of Testuwan Atomu proved quite popular, championed by Japanese children, adults and industries alike, within even the earliest Atom stories lie darker themes of discrimination and otherness. Notably, one of the few Atom episodes to feature the death of the boy-robot, the 1966 story “Blue Knight," tells the story of a failed fight for robotic freedom. The robot leader of this emancipatory movement, the Blue Knight of the story’s title, kills humans who stand in the way of robot liberation and even succeeds in founding a short-lived new robot nation called Robotania. As the story progresses, we find Atom slowly beginning to empathize with the Blue Knight’s crusade. For possibly the first time, he is depicted as questioning the logic behind the Tezuka’s Laws of Robotics, which— like Asimov’s own in the West— envision a world in which robots must put the good of their human counterparts above themselves. When humans ultimately wage war against this Robotania, crushing the Blue Knight and his rebellious robot cohorts, Atom is destroyed, as well, reduced to nothing more than one of the many mechanical causalities of the failed revolution. Of course, Atom would return, his popularity too great to ever allow him a true death— and especially not one in so grim a manner. By 1966, Atom had become the first hero ever to be animated for Japanese Television, with translated episodes already filling American airways, as well. Today, the impacts of Atom/Astro Boy are legion, far too great to easily measure here. Perhaps all too fittingly, they also contribute to the tangled web of influences with which I wrestled earlier in this post. In no small part thanks to Atom, Osamu Tezuka is credited with first introducing and popularizing “anime eyes," those impossibly large, glimmering ovals that are now synonymous with Japanese animation. But to trace the genesis of said peepers requires yet another trip back across the Pacific; before they were drawn onto the boy robot and his friends, strikingly similar eyes were busy helping characters like Donald Duck and Betty Boop look out into the world. Tezuka is quoted as being a large admirer of Walt Disney. Early in his career, he even redrew early Disney films like Snow White and the Seven Dwarves for Japanese audiences. Disney would return this artistic appropriation back to Tezuka over a half-century later, adding one more layer to the overlapping cultural exchange. Although Disney denies the connection, see here, Tezuka’s Kimba the Lion, alongside Disney’s The Lion King. And as for us, today? 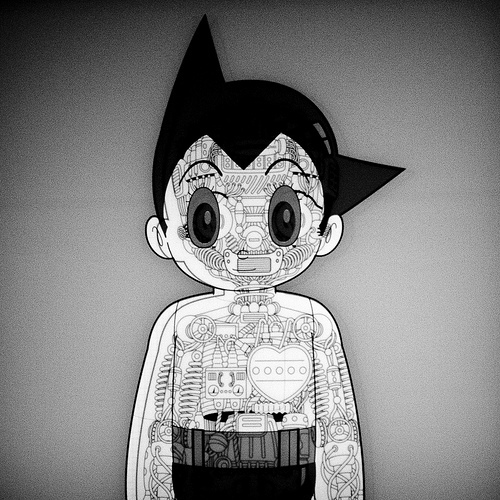 Astro Boy’s future is now our present— or perhaps, in some ways, already our past, for the boy robot’s official birthday, April 7, 2003, has already come and gone. While the world of robot-human harmony has not materialized as Tezuka’s story envisioned, it does feel to me like the cultural grip of robotics has already become a much more casually accepted phenomenon. In some form or another, the things are everywhere. Case in point, I found this guy at a home appliance store in Denpasar shortly after I arrived in Bali. It was nestled between plates and spoons, on sale for less than two dollars. I have no idea why it was there— and I have this impression that no one else would, either. But that’s sort of the point: unlike our fictions and fears, the real world’s robotic take-over won’t be signaled by metallic, soulless overlords but by the inexplicable, plastic decorations found in Aisle 7. It creeps up on you. First kitchenware, then the world… and whether or not that’s a good thing, well, I think it depends on who you ask. Coming in Part 2— Freud and Friends: Charting the Uncanny Valley. I.In the Noh, I am told, your 68th birthday inaugurates an important year in your life as a performer. Admittedly, by the time you turn 68 it has probably been 20 to 30 years since you were at the peak of your physical ability. But when you were at the prime of your technique, you had not yet accumulated the life experiences needed to best exhibit your potential. 68 is the year in which your now declining technique and your life’s life meet at their highest, most harmonious point. II. In Noh, you might hear about the early idea that a spirit or God resides within each Noh mask and that, by putting on the mask, you are welcoming this spirit or God to fill you from within. I ask Tatsushige if he believed this and he says, well, notreally, but that as an image it is still very powerfully and good. He then pauses and says that, once— maybe in his early twenties— he did feel like the God had entered him through the mask, for just five to ten seconds. But that was once, and it was a long time ago. III. The Noh mask is carved out of a single piece of Japanese Cypress (檜). The same wood is used to construct the Noh stage, itself. "You should know the matter of essence and function of Noh. Essence is like the flower, while function is like the fragrance. Again, this is like the moon and its light. If you are able to understand essence, function will come into being on its own. Thus, in watching Noh, those who know watch with their minds, while those who don’t know watch with their eyes. What is seen with the mind is essence; what is seen with the eyes is function." Although I sometimes find— or am given or told— a summary of the Noh play I am about to see performed, I often enter the theatre completely blind. Reflecting on the bulk of these experiences, I was surprised to realize how even the barest of narrative outlines could so greatly help my ability to remain engaged throughout the performance. I found I needed story. I sometimes see audience members following the performance with the play’s script in hand. A couple performers have told me, however, that they feel this is the improper way to experience Noh. It is too intellectual, too much viewing with just the eyes. V. Zeami again— "Even though you may be conversant with various types of role-playing, if you do not understand what it is to have the Flower, it will be like collecting grasses and trees when they are not in bloom. The flowers of a thousand grasses and ten thousand trees are all different colors, but to the mind that sees them as interesting, they are all the same: flowers." VI. Because the Noh is so still, so contained and so reduced, the bigger movements feel exceptionally large. One dance told the tail-end of a story about two lovers who disobey their parents and continue to meet each other in the cover of night. The parents decide to break the bridge that the two cross to meet one another, thinking it will put a stop to their romance once and for all. In the next night’s darkness, the two lovers fail to see that the bridge is broken and plunge to their deaths. When the story of the dance reached the moment that the lovers should fall, the Shite, standing on one leg, suddenly dropped into a seated position with his head hung low. The abrupt change in rhythm and unexpected fall felt electrifying. My heart pushed through my chest as if I was watching death-defying stunts, its kinetic energy echoing through the stillness and silence. VII. The music of Noh has been unlike anything I have ever heard before. The rhythms follow 5 and 7 counts but are then fit within an 8 count, as well. Entire phrases might all fall on the same note, and when the notes do change, they do not jump in octaval patterns. Single notes are stretched and phrases build as if in conversation. I once told one performer that I can tell he knows exactly what he is saying when he chants, but he told me that, on the contrary, he often only understands a paraphrased meaning at best. In one song, I struggle with a particularly long passage of equal length, same note sounds— つ か い は き た (Tsu-Ka-Ee-Ha-Ki-Ta). The repetition leaves me uncertain, doubting dynamics and how to fill the phrase. It all sounds the same. After a particularly frustrating go, I decide to pretend that I am secretly saying “Today-I-Went-To-The-Store." Suddenly, it all sounds much more decisive, like I know exactly what I mean to say. VIII. While entering into the musical composition was difficult at first, I found the musical notation used in Noh very intuitive. Each note is denoted through wisps and lines that look to me like strokes of paint that might have been made by the path of the sounds. When I sing the notes of a Noh chant, I easily imagine these shapes coming out from somewhere inside of me. I pretend my voice is the paint. IX. In addition to the chanting, one to three different drummers and a flutist accompany the performance— each with their own rhythms, as well. They bob and weave around and atop one-another and the chanting, quickly alternating between complementary and contradictory rhythms. At first, it is overwhelming— not quite a cacophony but enough to leave me marveling at the performers’ and musicians’ ability to all keep their places. The chanting chorus will pause for minutes and then re-enter the fray at just the right moment. X. Even the way you fold your rehearsal clothing has a strict form to learn and follow. XI. During class one day, Tatsushige tells me that sometimes he feels like he is a puppet when performing. Moving through a series of set forms, donning a mask and assuming the identity of another character— these aspects of Noh acting can leave him feeling like he has separated from himself. But during the best of his performances— Tatsushige continues to tell me— he feels as though he is the puppet master, as well. It’s like there is a little Tatsushige sitting inside of big Tatsushige, controlling the performance, he says while laughing. XII. 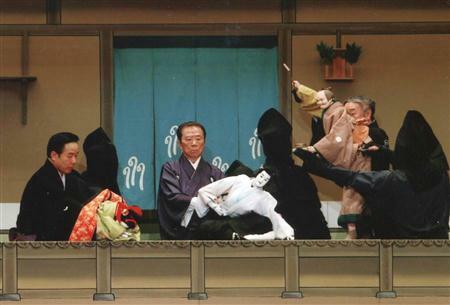 Without a doubt, Noh is a total work of art— but maybe not in the Gesumptkunstwerk framework. Tatsushige began studying when he was 3. He is now 30, but it will still be a long time before he is considered a master. I took this idea seriously from the start, but I will admit that, at first, I related to it as though it were some sort of charming philosophy or Zen teaching— perhaps as a little factoid I could tell a fellow American to highlight an artistic or social perspective not so oft-adopted in the West. After only three months of study, I now see a practical reality to it, too— one that resonates more deeply. Each Noh performance features a collision of numerous musical, movement, and narrative elements. Accompanying this is the unavoidable fact that everyone onstage must know everything— actually, more than just know everything. It must be like breathing. You can control it if you want, but you can also trust it’s there without thinking. As an actor, Tatsushige does not play the drums or flute, but he tells me that when he’s at his absolute best, he feels as though he is secretly playing them all inside himself. He sometimes practices them in his free time. When we practice chanting, he can play multiple drum rhythms, denoted through hand claps with distinctly different tambours, while still supporting me in chanting, as well. Everything within a performance that can be set is set. Only then can the performers begin to effectively engage with all the elements that aren’t or can never be set— the air temperature, the audience, your own feelings, what you are for breakfast. In the mime class that I’ve been teaching in Kyoto, I try to help cultivate a feeling of opposing yet complimentary forces within one’s own body. It’s the feeling that as I lengthen up through my spine, I am also firmly rooted in the earth; that as I find a forward intention with my heart and the weight in my feet, I still remain in place. Such forces exist in Noh, as well, but Noh has drawn my attention to other kinds of forces, as well. Here the varied rhythms of the drums, flute, and chanting pull me in opposing directions. Here there is a collective sense of breathing shared— or sometimes debated— among the performers; Here, the importance of the story’s build tugs at me through each moment. When successfully managed, these combined forces tether me dramatically as much as my own forces tether me in physical space. It is difficult. A Noh performance is like the most delicate of machines, one that requires numerous rare, hand-made parts. It’s a machine that can, at times, feel cantankerous. To reach its maximum potential, it requires the utmost perfect of operating conditions. Because of this, it’s now a machine that some people have discarded for what appear to be newer, more efficient models. 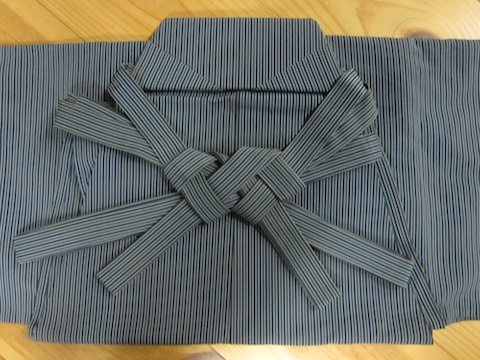 But when everything aligns, the Noh performance hums like a machine yielding a product you just can’t find anywhere else. The room sings. 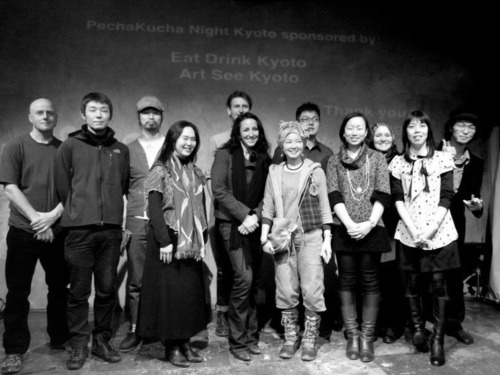 Last night I gave a mini lecture and performance in Kyoto as part of PechaKucha, an event that invited ten speakers to present twenty slides on a topic of their choice. Each speaker gets 6 minutes and 40 seconds (20 seconds per slide) so you’ve got to pick your information carefully or really cram it in! Unfortunately, the video of the event, which I originally embedded into this post, is causing all kinds of problems to browser's Flash plug-in. Rather than risk inflicting such annoyance on you, as well, I've gone ahead and taken the video down. You can, however, still view it by clicking here, or by clicking on any photos in this post. In the linked video, I kick off with my presentation at around the 3:40 mark. In it, I try to quickly debrief the audience on my Watson project and research before performing a small, modified extract from “See You Soon." It was a lot to show but somehow I made it through. I think it turned out pretty well! More importantly I had a blast meeting and sharing with everyone there. If you’ve got the time, definitely check out the rest of the video— and also the first half— in which you’ll find, among other things, presentations on Quantum Physics, West African Dance, Macro-Biotic Cooking, and even a soon-to-be released iPod App called “Toilet Panic." Big thanks to Eric Luong for inviting me to present, to Haruna for translating the words of Jean-Louis Barrault into Japanese and also lending me a chair and rehearsal space, to everyone involved in organizing the event, and especially to all of those who came out for a great night. I couldn’t believe how many people came to support their friends, have a few beers, and (hopefully) learn a new thing or two. The house was packed and the atmosphere was fun and welcoming. If there’s a PechaKucha event happening near you (and with events happening in over 450 cities across the world, odds are there might), I recommend you check it out! You can find more information about the wheres and whens around the world here. In 1968, Jim Henson filmed a documentary about puppetry with the help of Frank Oz, Jerry Juhl, Don Sahilin, and some of his early Muppet friends. Shot in Hersey, Pennsylvania at the public television station WTTF-TV, it ran on NET, National Education Television (what would later become PBS), in 1970. The films covers many topics, including a brief but charming primer on world puppetry, a presentation of the different types of Muppets as well as other Henson creations, and a lovely demonstration of how to make simple puppets of your own. Above you’ll find Part 1. Click here for Part 2, Part 3, Part 4, Part 5, Part 6, and Part 7. If you’ve got about an hour to spare, I definitely recommend checking it out! I was lucky enough to meet Gary at a conference about puppetry and politics held this past fall in London. Now based in Melbourne, Australia, Gary had flown out to give a talk about his 25 years of experience using puppets as a means for significant outreach into otherwise ignored, oppressed, and/or under-represented communities. Learning about Gary’s work re-affirmed for me the power of the puppetry to make unique, theatrical inroads into subjects that sometimes seem too large to tackle. Very inspiring. Today I became 金 再無. Yesterday I witnessed my first puppet ritual suicide. It had been a long day. 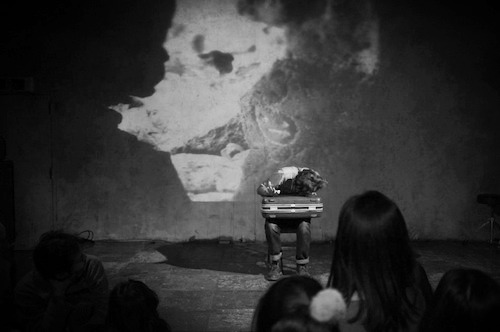 By the time Sakuramaru emerged from an inner chamber, soon met by his father carrying a silver knife from the side room and his young wife crying in short bursts of disbelief, some members of the audience had fallen asleep. Those of us who had come for the entire day’s performances were into our seventh hour of puppet theatre. I was tired, too. My right leg had fallen asleep and the already compact Japanese theatre seats seemed to grow more cramped every fifteen minutes. Yet it all melted away as the show built to its climax. The stillness of the Sakuramaru puppet, matched by the face of its lead puppeteer in poise and resolve, spoke volumes in silence. The Tayu— the man responsible for narrating the story as well as voicing all the characters— turned on a dime, steering his performance from role to role, his voice bouncing in rhythm and tone while his face passed from one extreme emotion to the next. The puppet of Sakuramaru’s father, who had been striking a bell while repeatedly chanting in prayer for his son, begins to miss the bell with his mallet, unable to fight off his tears any longer. At the last moment, Sakuramaru’s wife tries one last time to stop her husband but Sakuramaru, in a display of intense resolve, manages to pin her down with one knee while still finding the strength to plunge the knife deep into his abdomen. With the puppet flesh pierced, no blood followed, nor trick lighting, red fabric, or surprise transformation; there was just a lifeless doll, still tucked in the seiza seated position, his torso now collapsed upon his knees. Animated materials turned inanimate once again. And meanwhile we in the audience sat and seeped in prolonged silence. I noticed the woman sitting next to me wiping tears from her eyes and then realized that I, too, was crying. I did not blubber, nor was I struck by overwhelming, uncontrollable sobs. Instead, I felt the slow growth of a few tears in each eye, culminating in one brief bout of blurred vision— certainly a smaller display of empathic response, but somehow one that felt more appropriate for the such simplicity and restraint. The Bunraku I witnessed effortlessly blended rigorously methodical compartmentalizing with a collective purity of purpose. It was logical yet also improbable, distancing yet also overwhelming, light yet also exhausting. It was something I need to see again. To welcome in 2012, I was lucky enough to travel with good company into the mountains of Japan. 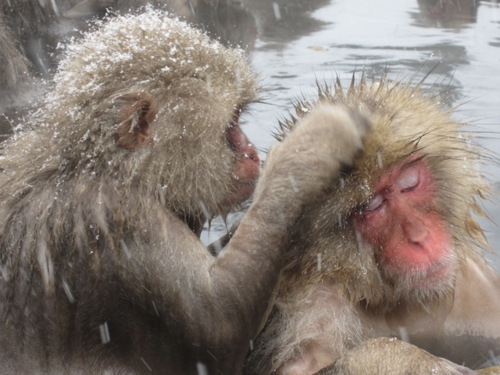 After settling into the tiny, snowy town of Yudanaka, we trekked even higher in search of a particular group of Japanese Macaque monkeys that spend their winter days bathing in a natural hot spring. It was such a treat to see! We had been told beforehand that the monkeys would remain uninterested in befriending or attacking us so long as we didn’t make direct eye-contact with the them, but it was still surprising to see them walk right past us along the path en route to the hot spring. As upwards of 10 to 15 people gathered around the water to take their pictures, the majority of the monkeys appeared completely indifferent to the photo shoot in which they all were starring. It’s been said that the only thing separating a normal human from a human pretending to be normal is an audience— the idea being (first) that as soon as we become aware that we’re being watched, a least a little bit of us starts performing, and (second) that this self-awareness inevitably gets in the way of said performance, mucking up our ability to just be ourselves. So long as we’re telling ourselves to just act natural, we just can’t seem to act natural. According to the Monkey park website, people have been coming to see theses monkeys bathe since 1964. That’s a lot of photographs. And yet, despite their years of modeling, these Macaque monkeys still feel to me anything but posed— a far cry from the majority of photos taken of their human counterparts. Cameras are everywhere these days, and even though their utter ubiquity has successfully reduced such a statement into an absolute truism, it hasn’t rendered their impact meaningless. Saying cheese for the camera might no longer feel like a performance, but think back to that time your mom took forever to figure out how to work your new digital camera, leaving you and your friends stuck in photo-ready limbo with frozen smiles drooping; or think about how everything becomes much funnier right before a picture’s taken, when everyone is willing to laugh too hard at dumb lines in an attempt to grab hold of a more authentically joyful face; or even think about that one person you know who always brings a camera along to document and upload evidence of last night’s great time on Facebook— and who once might have even made a half-ironic joke along the lines of: “if it’s not on Facebook, it never happened" before chuckling a little too loudly (or perhaps not loudly enough). Just because photographs serve as such accessible and ready-made relics of our actual experiences doesn’t mean they always fulfill a purely documentarian role. Instead, they often corroborate with our desires to present what we wish had been in lieu of what really was, a carefully tailored image of our own pasts. But while posing for photographs has become a universally experienced form of performance, it’s still one that I— for one— am somehow not very good at. I’ve gotten better over the years, no doubt, but whenever I smile for the camera I am returned to an uncomfortably familiar territory of trial and error. My eyes get too squinty or my mouth spreads too wide, and please don’t let me wax about that perfect balance of gum and teeth, which I almost inevitably overshoot. Once, in trying to understand the art of the photogenic phenomenon, I read that Science (with a capital S) has proven that the facial muscles used for voluntary and involuntary smiles are controlled by different parts of the brain. This left me with two thoughts— either some deeply insecure scientists went to extreme lengths to soothe their sore egos, or our bodies seemed to have doomed us from the start. So then what about those lucky people who just always look good in pictures? Out of more than pure resentment (I swear! ), I just don’t believe that they’re always that happy, that joyful, that put together. If you buy my earlier claim that photography is performance, then you might also agree that, like all forms of performance, photography will have its share of better and worse actors. If so, please allow me to offer one last conjecture: while idiosyncrasy always lies somewhere within the best performances, the people who typically seem most convincing have usually put in the most rehearsal time, as well. I can’t think of a better example of this than an ancient (by online standards) internetmeme dating all the way back to 2005. Through a somewhat cruel-hearted gag involving the repetitive and accelerated digital flip-books, the internet may have revealed the greatest secret of photogenia; not only do these celebrities look good all the time, they look exactly the same all time, too. And therein lies the almost sinister paradox fundamental to photographic performance: those who look natural on camera are in fact, quite artificial, and those who look artificial are usually being quite natural. Tellingly, when this meme quickly and inevitably yielded its more ironic and self-knowing parodies, the featured human figures all fell away, replaced by legos, muppets, and finally, Han Solo frozen in carbonate. Such parodies make for a fitting conclusion to the joke; by excelling at producing a single, identical face on command, Lohan and Hilton become almost inhuman, dolls trapped in a lightning round of dress-up. Aside from some good old fashioned celeb-bashing, the artifice highlighted by this meme is a testament to the fact that Naturalism is performance style— some would even say technique— like any other. It requires practice, training, and thoughtful preparation. Unlike various other acting styles, however, it places a far greater imperative upon hiding these facts from its audience. Rendering such facts visible again requires additional, alien stylistic elements and/or twists— see, for example, Juxtaposition and Repetition, illustrated digitally in the links above and in a live performance below. Check out this brilliant clip from Zero Degrees, a duet by two of my favorite contemporary dancers/choreographers, Akram Khan and Sidi Larbi Cherkaoui. Yet in spite of what I’ve written about naturalism as a performance style, a few quick glances at these monkeys is all it takes for me to relapse into a gush over their nonchalantly photogenic look. Try as I might, I just can’t shake how natural— in the absolutely real sense of the word— these monkeys appear on camera. So what gives? I’m won’t go so far as to suggest that they lack self-awareness, but if the Macaque monkeys do become self-conscious, they certainly don’t seem to be expressing it in the same way we humans do. Now is probably a good time to note that I am far from the first person to make these observations. In fact, when pondering over the state of humanity, this apparent gap between man and monkey— and by extension, between man and theoretically every other animal— has oft-served as rhetorical imagery. For centuries now, whether humans are receiving praise for their higher intelligence or critiques of their consciousness, you can bet that some animal is waiting in the wings to perform the role of “natural" foil, and this can yield some curious results. From this claim, the interlocutor casually offers a grand thesis: “Grace appears most purely in that human form which either has no consciousness of an infinite consciousness. That is, in the puppet or in the god." It’s strong stuff, but Kleist’s character isn’t entirely convinced, so his partner provides a few examples to fortify his argument. First, we are told the story of a beautiful young man whose grace meets its match in the form of an even more beautiful statue. Consumed by his inability to replicate the statue’s poise and position, the young man reportedly begins to spend entire days in front of the mirror practicing. Although his best efforts are to no effect, the man presses on and, in doing so, further fixates on his problems. As he comes to understand the nature and limits of his own grace, he loses all traces of it. “An invisible and incomprehensible power seemed to settle like a steel net over the free play of his gestures," our interlocutor continues. “One year later, nothing remained of the lovely grace which had once given pleasure to all who looked at him." To better drive his point home, our marionette praiser next recalls a story from his own life, the (slightly improbable) time he challenged a bear to a fencing match. As you might expect, this is where the aforementioned curiousness emerges. From the get go, our champion is clearly outmatched by the bear’s strength and size. Skilled fencer that he is, however, he attempts to overcome these disadvantages with his skills of deception, throwing out a series of feint attacks meant to trick the bear into letting his guard down. But lo and behold, the bear sees right through these feints and does not budge. “No human fencer could equal his perception in this respect," our man notes. To its credit, the bear “stood upright, his paw raised ready for battle, his eye fixed on mine as if he could read my soul there, and when my thrusts were not meant seriously he did not move." Unsurprisingly, the human loses the fight. Like the marionette and statue before it, this bear appears to be unburdened by the troublesome mind/body disconnect that has cursed his human foil. Even more so, Kleist’s portrait of the bear suggests that its gracefulness is so pure that it can immediately sense the inauthentic struggles of its human peers and act accordingly. A strike is a strike, a fake is a fake, and there will be no confusion of appearances. Here Kleist fairly explicitly suggests a connective link between the living, breathing bear and its two frozen counterparts. Each possess a purity of purpose that appears to be lost upon we humans. But for this logic to stand, the bear— like its marionette and statue’d counterparts— must be entirely without consciousness. This is, after all, the crux of Kleist’s argument. It’s not as though marionettes have resolved the mind/body problem through a harmonious synthesis; instead, they wind up bypassing it entirely by simply removing one of the two incongruous components. Simply put, nothing stands in the way of their physicality because there is, in fact, nothing standing in the way of their physicality. Marionettes are all body and no mind— and so too must be the bear; anything else, and it would flinch. is nothing other than a statue or machine made of earth, which God deliberately makes as similar to us as possible. Consequently, he not only gives it the external color and shape of all the parts of our bodies, but also puts in all the components necessary to make it walk, eat, breathe, and in short imitate all those of our functions that can be imagined to come from matter and depend only on the disposition of our organs. Here, Descartes has effectively leveled the physical playing field. While bodies may come in different shapes and sizes, whether you are animate or inanimate, human or animal, all material selves are designed to competently exist without the need for free-thought. The primary functions of all creatures run like well-oiled machines, following “naturally from the disposition of organs alone, no more and no less than those of a clock or automaton follow from that of its counterweights and wheels." When this mechanic body meets its rational mind, however, things change. The ship gets its captain. Assuming command of the entire system, the mind reigns over this previously empty vessel. The once automatic body is now subjugated, piloted to always answer to the whims of its new master. Descartes again: “When the Rational Soul is in the machine, it will have its principal seat in the brain, and there it will be like the person in charge of the fountains, who must be in the control pit (where all the pipes from the machines come together), when he wants to set them going, or stop them, or change their movements in some way…"
Unfortunately, this newfound control comes at a price. Movement spurred on by rational command somehow comes out slower than automatic instinct— not to mention how often it’s flat out wrong, a unsuccessful attempt to live out a unreasonably perfect image crafted by a mind unconstrained by physical reality. And by the way, this is all just one task we’re currently considering, and when, if ever, can you remember having the ability to truly focus all your thought into one single action? The more tasks get juggled, the further things fall from the mark. Rare is the the mind that may guide its body without complications. Say what you will about free-will, but as pure automata we certainly were efficient. Now guided by a master that is, itself, guided by complicated self-interest, said efficiency begins to decline. Rational thought, it would seem, comes at a price, trading grace and ease for choice and self-knowledge. Or, in other words: Machine 1, Human 0. But can we extend the score to: Bear 1, Human 0? The most that one can say is that though the animals do not perform any action which shows us that they think, still, since the organs of their body are not very different from ours, it may be conjectured that there is attached to those organs some thoughts such as we experience in ourselves, but of a very much less perfect kind. To which I have nothing to reply except that if they thought as we do, they would have an immortal soul like us. This is unlikely, because there is no reason to believe it of some animals without believing it of all, and many of them such as oysters and sponges are too imperfect for this to be credible. Clearly, Descartes has a strong dichotomy in mind: humans on one side, and puppets, automata, fountains, bears, birds, bees, clocks, and everything else on the other. Why an oyster and a monkey, animals who share far fewer similarities between them than monkey and man, should be so easily lumped together has never been entirely clear to me. The answer to which I find myself continually return has more to do with Descartes’ ego than anything else— as if he was unwilling to award anyone but his own species the final prize of a soul. That is to say that, while we may have lost our grace to self-awareness, so long as this self-awareness originates from our soul then its very existence proves our ethereal immortality. Bear 1, Human ∞. That is all, of course, assuming you believe in immortality, the soul, and plenty of other things I dare not dive into now. Heinrich von Kleist, for his part, does appear to believe in the soul— or at the very least, some sort of divine absolute— but it is worth noting that he also believes we will never reach this absolute during our material lives. Thus, his thesis— Grace appears most purely in that human form which either has no consciousness of an infinite consciousness— and his suggested course of action, towards the puppet. I enjoy the grounded quality of Kleist’s perspective here. He manages to uphold the idea that soul-borne self-awareness might serve us well in the long-run, while openly admitting that, in the day to day, we’re still stuck as clumsy as ever. But perhaps there is hope for our material selves, after all. Recent research that certain qualities we’ve long held as fundamental to being human might not actually be as exclusive as we first thought. Take, for example, the fairly recent discovery that Chimpanzees, our closest link to that vexing other side of the Descartean dichotomy, can recognize themselves in a mirror. Among other things, this degree of awareness suggests that Chimpanzees possess a far greater sense of self than Descartes had ever imagined. To my knowledge, the Japanese Macaque snow monkeys have not yet undergone such a test, so the jury’s still out on just what makes the original simian culprits of this too-long post seem so natural in camera. Should the study ever come out, however, I’ll be sure to let you know. As we all wait (with baited breath, I’m sure), may I recommend re-watching Spike Jonze’s 1999 film, Being John Malkovich, with this post in mind? In my opinion, it’s no coincidence that a film so playfully engaging with people and puppets would feature a monkey, as well. Catch John Cusack’s character Craig Schwartz— whose very name is a composite from the names of American puppeteer Bruce Scwartz and "friend of the blog" Edward Gordon Craig— at the very beginning of the film when he turns to his wife’s chimpanzee, Elijah, and mutters with no less Ego than Descartes, “You don’t know how lucky you are being a monkey, because consciousness is a terrible curse. I think. I feel. I suffer." Or, if you’re understandably done with the whole thing, maybe it’s best to give your gears a rest and just enjoy hot springs. Either way, cheers.